Biography & Genealogy: Joseph White Latimer, Class of 1863: Genealogy: Born- Aug. 27, 1843 at Oak Grove, Prince William Co.,Va. Father- Samuel H. Latimer; Mother- Charlotte Barron. No information about grandparents. Never married, no children. VMI Record: Entered VMI- July 27, 1859; Left ca. Sept. 1861 to join Confederate Army; Made Honorary Graduate of the Class of 1863, July 2, 1869. Civil War Record: (Known as "The Boy Major"). 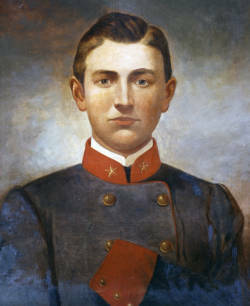 Drill Master for VMI Corps of Cadets in Spring of 1861; served with Hampden Light Artillery, which became Co. C, 38th Battalion, Va. Light Artillery, and Capt. W.A. Tanner's Co Va. Light Artillery; elected 2nd Lieut. of Tanner's Co. Sept. 13, 1861; Elected 1st Lieut. April 30, 1862; Promoted to Captain July 30, 1862; absent sick Oct 1862; promoted to Major April 4, 1863; assigned to command artillery battalion previously commanded by Lt. Col. R. S. Andrews; Mortally wounded July 2, 1863 at Gettysburg. Had arm amputated. Died- Aug. 1, 1863 in Harrisonburg, Va. from wounds sustained at Gettysburg. Buried at Woodbine Cemetery in Harrisonburg.